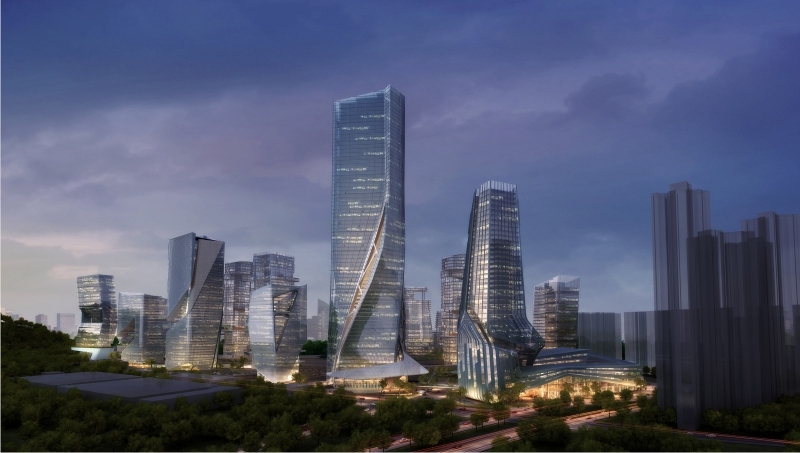 Shenzhen, China’s experimental Special Economic Zone, is often derided for its lack of history and culture. This is in no small part due to the fact that the city is essentially a boomtown that is more or less just over 30 years old. Yet making up for this drawback is the fact that the city has some of the most interesting and innovative new architecture being built in the country. I was recently informed of a design for a compelling new project that fits the bill for Shenzhen’s growing stock of interesting buildings. The Yabao Hi-Tech Park is a new development by the Shenzhen-based Galaxy Group and designed by the architecture firm 10 Design. 10 Design is relatively new firm based in Hong Kong, started by former employees of the global corporate giant RMJM. Founded less than 2 years ago, 10 Design is an upstart successfully challenging other multinational firms for commissions in the Mainland China market. 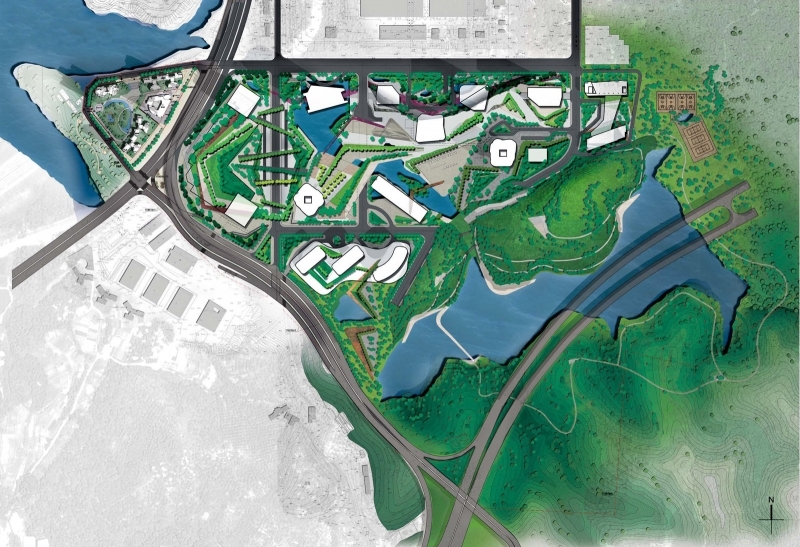 With the Yabao Hi-Tech Park, 10 Design looks to establish itself as a serious player in the global architecture sphere. In the designer’s words, the project “is an examination of the relationship between a pristine rural landscape and the advancing forces of a rapidly growing city.” Just over a million square meters in gross floor area, the park features 18 high-rise towers ranging from 100 – 300 meters tall, a 5-star hotel, and 3 residential towers. The main building, a 300 meter tower flows out of an adjacent stream, twisting up towards the sky. The 220 meter tower to the right of the main building melds with the retail podium and pulls itself along the freeway edge, creating a bold and iconic public image for the development. The towers reflect the forward-looking nature of the developer by utilizing high-tech facade systems, including a series of balconies that pull off from the facades to allow vegetation to grow up the sides of the buildings. Interesting enough, included in the vegetated facades is an algae system that neutralizes air pollution 24 hours a day. The project will be realized soon, as construction broke ground in October of last year. 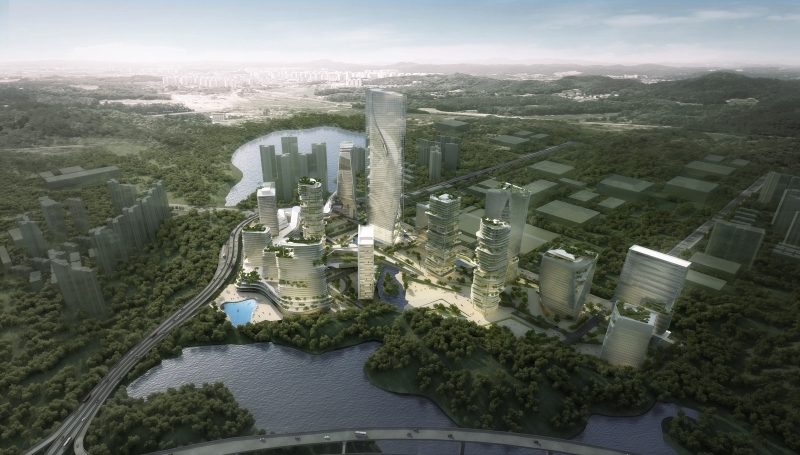 Upon completion, Yabao Hi-Tech Park will be an interesting new addition to the urban fabric of Shenzhen and will solidify 10 Design as a competitive international architecture firm.